Today marks the 36 year anniversary of the Blizzard of '78. Much of the northeast including New England is still digging out and cleaning up from the recent snow & ice that affected the area. How does this storm compare to the infamous Blizzard of '78? The answer...it doesn't! Not to down play this recent storm, but maximum snowfall amounts were mainly in the 8-14 inch range, meanwhile max snowfall amounts from the Blizzard of '78 were in the 30-40"+ range, with drifts to 20 feet + reported! So, how does a storm 40" snow storm come about? Well this intense system required many ingredients to occur together at the perfect time to create the large and powerful storm. These ingredients included an unusually strong high pressure over central Canada which provided the very cold air, and a nearly stationary blocking high pressure system over Greenland. An area of strong low pressure aloft and at the surface moved out of the Great Lakes to the Mid-Atlantic coast, where it deepened rapidly to sub 984mb. The storm system slowed and stalled off the New England coast for nearly 36 hours, creating long lasting blizzard conditions in New England. Some other interesting facts on the Blizzard include: it was forecast remarkably well several days in advance with winter storm watches issued approximately 30 hours ahead of the system. This was quite good lead time for the 70s. Unfortunately many people were still stranded on area highways because the onset of snow was slightly later than predicted, causing people to believe this was another 'busted' forecast which had happened several times the month before. Near blizzard conditions lasted for about 15 hours in New England and it became the only true official blizzard in Boston (since 1961) when sustained winds of 35mph + were reported for more than 3 consecutive hours from 2 - 6 PM on 2/6/1978. Overall, the storm lasted nearly 36 hours and paralyzed the entire region for one week. The highest, unofficial snow total from the blizzard was an astounding 55 inches in Lincoln, RI with drifts up to 27 feet reported! Winds were incredible with this storm system; Boston reported a peak wind gusts of 79mph while Chatham, MA saw 93mph! Due to these horrendous conditions more than 5,000 cars were abandoned on I-95 and route 128, with more than 2,000 homes destroyed during the storm. More than 10,000 people had to spend time in shelters to ride out the storm and unfortunately 99 people lost their lives from this devastating storm; total damages topped $1 Billion dollars in the Northeast! 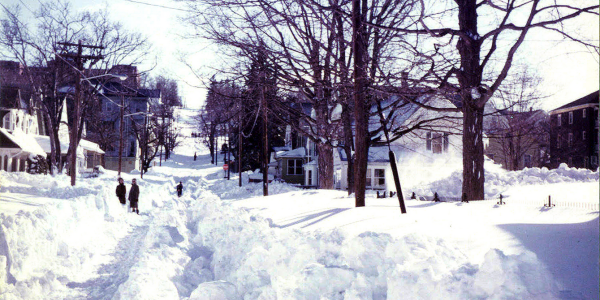 The blizzard of 1978 was one of the worst on record and is surely remembered by anyone who were there to witness it.